How can I programmatically get the phone number of the device that is running my android app? According to the highly upvoted comments, there are a few caveats to be aware of. This can return null or "" or even "??????? ", and it can return a stale phone number that is no longer valid. If you want something that uniquely identifies the device, you should use getDeviceId() instead. There is no guaranteed solution to this problem because the phone number is not physically stored on all SIM-cards, or broadcasted from the network to the phone. This is especially true in some countries which requires physical address verification, with number assignment only happening afterwards. Phone number assignment happens on the network - and can be changed without changing the SIM card or device (e.g. this is how porting is supported). I know it is pain, but most likely the best solution is just to ask the user to enter his/her phone number once and store it. Update: This answer is no longer available as Whatsapp had stopped exposing the phone number as account name, kindly disregard this answer. There is actually an alternative solution you might want to consider, if you can't get it through telephony service. As of today, you can rely on another big application Whatsapp, using AccountManager. Millions of devices have this application installed and if you can't get the phone number via TelephonyManager, you may give this a shot. Of course you may not get it if user did not install WhatsApp, but its worth to try anyway. And remember you should always ask user for confirmation. But remember, this code does not always work, since Cell phone number is dependent on the SIM Card and the Network operator / Cell phone carrier. Get the user's phone number as manual input from the user. Send a code to the user's mobile number via SMS. Ask user to enter the code to confirm the phone number. Save the number in sharedpreference. Do the above 4 steps as one time activity during the app's first launch. Later on, whenever phone number is required, use the value available in shared preference. Just want to add a bit here to above explanations in the above answers. Which will save time for others as well. In my case this method didn't returned any mobile number, an empty string was returned. It was due to the case that I had ported my number on the new sim. So if I go into the Settings>About Phone>Status>My Phone Number it shows me "Unknown". Sometimes, below code returns null or blank string. There is another way you will be able to get your phone number, I haven't tested this on multiple devices but above code is not working every time. You will need to add these two permissions. So that's how you request a phone number through the Play Services API without the permission and hacks. Source and Full example. TelephonyManager is not the right Solution,Because in some cases the number is not stored in the SIM, Due to my suggestion,You should use Shared Preference to store user's Phone number first time the application is open, and after that the number will used whenever you need in application. First of all getting users mobile number is against the Ethical policy, earlier it was possible but now as per my research there no solid solution available for this, By using some code it is possible to get mobile number but no guarantee may be it will work only in few device. After lot of research i found only three solution but they are not working in all device. There is the following reason why we are not getting. This method is working only in Redmi 2 prime, but for this need to add read contact permission in manifest. Note:- This is also not the guaranteed and efficient solution, I have tested this solution in many device but it worked only in Redmi 2 prime which is dual sim device it gives me two mobile number first one is correct but the second one is not belong to my second sim it belong to my some old sim card which i am not using. In my research i have found earlier it was possible to get mobile number using WhatsApp account but now new Whatsapp version doesn’t storing user's mobile number. Conclusion:- Android doesn’t have any guaranteed solution to get user's mobile number programmatically. Suggestion:- 1. If you want to verify user’s mobile number then ask to user to provide his number, using otp you can can verify that. If you want to identify the user’s device, for this you can easily get device IMEI number. A little contribution. In my case, the code launched an error exception. I have needed put an annotation that for the code be run and fix that problem. Here I let this code. Although it's possible to have multiple voicemail accounts, when calling from your own number, carriers route you to voicemail. 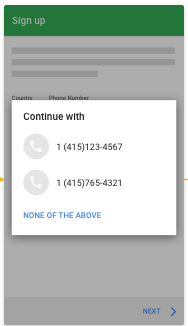 So, TelephonyManager.getVoiceMailNumber() or TelephonyManager.getCompleteVoiceMailNumber(), depending on the flavor you need. while working on a security app which needed to get the phone number of who so ever my phone might get into their hands, I had to do this; 1. receive Boot completed and then try getting Line1_Number from telephonyManager which returns a string result. 2. compare the String result with my own phone number and if they don't match or string returns null then, 3. secretly send an SMS containing the string result plus a special sign to my office number. 4. if message sending fails, start a service and keep trying after each hour until sent SMS pending intent returns successful. With this steps I could get the number of the person using my lost phone. it doesn't matter if the person is charged. Not the answer you're looking for? Browse other questions tagged android phone-number telephonymanager or ask your own question. How to get mobile number phone on android 4.1.2 ? How To get Mobile Number in android studio? How to get android phone number programmatically?